One of the most flashy of the different dragonfruit flowers: the Zamorano is extremely colorful! 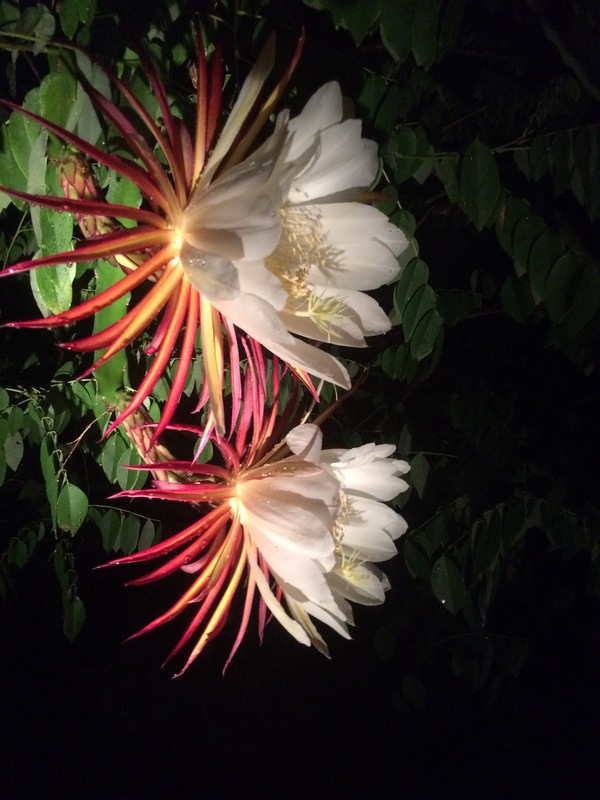 The nighttime dragonfruit hand pollination routine is part luck and part intricate cheoreography, to collect and use the pollen in the right sequence. A metaphor for many things! Grown here at ARTfarm in the old cattle pastures, now gardens: Haitian kidney and Julie mangoes, dragonfruit, a few pineapples, loads of beautiful papaya, passionfruit, lots of sweet potato, Italian basil, garlic chives, recao, rosemary, lemongrass, sweet potato greens, and seasoning peppers! And from our local St. Croix partners we have Nam Doc Mai and Mallika mangoes from Tropical Exotics, honey from Errol and goat cheese from Fiddlewood Farm.